So a couple of months ago, just before my birthday, I was talking about birthday presents with my cousin Ryan and his girlfriend. 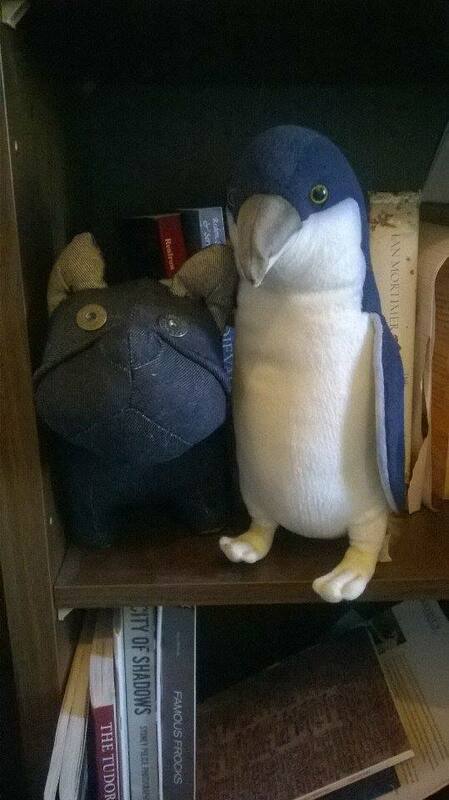 While my request for a penguin seemed perfectly reasonable, I was a bit surprised when he said that all he wanted for his birthday was some pickled eggs. When The Old Foodie posted a selection of historical pickled egg recipes a week later, it just seemed like the universe was sending me a message. Fast forward several months and the week of his birthday I was not only ridiculously busy but also quite sick. I suppose I could have changed my mind and used a modern recipe with, you know, quantities and real instructions, but where is the fun in that? Oh and why just make one historical recipe when you can do two? And so, although the process was not without hiccups, the eggs were pickled and enjoyed and I sat down to write this post. Actually I’ve tried a number of times, but each time I got side-tracked into doing more research. In spite of scouring dozens of cookbooks, I cannot find an older English recipe than the sage recipe which was posted by The Old Foodie and dates from 1725. Since the pickled egg is a favourite among re-enactment groups I had just assumed that they were much older, and so apparently do lots of modern cookbook writers. These led me back to Dorothy Hartley’s book Food in England which says that, “When eggs are plentiful, farmers’ wives take four or six dozen newly laid, and boil them hard; then, taking off the shells, they place them in earthenware jars and pour upon them scalding vinegar well seasoned with pepper, allspice, ginger, and garlic. 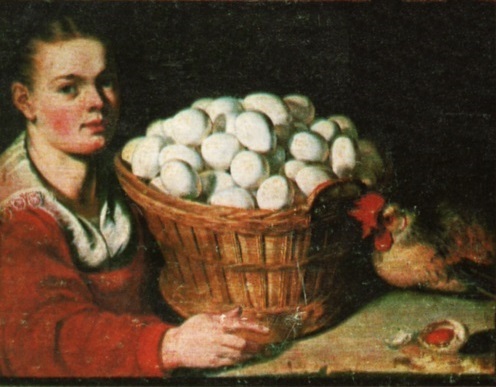 The eggs are fit to use after a month.” She says this recipe comes from 1700 or thereabouts, although nearly identical recipes appear throughout the 19th century, the earliest version I can find is from 1844 in The Mechanic’s Magazine. That’s definitely going to be the next pickled egg recipe I try, but I doubt that it will be as pretty as the second recipe that I made. Dyed pink with beetroot juice, this recipe comes from The Practical American Cook Book, Or, Practical and Scientific Cookery. The Old Foodie quoted an 1855 edition, but I have only been able to find an 1863 edition. Today these pink eggs are particularly associated with the Pennsylvania Dutch and they make a lovely addition to salads with their variegated colours. 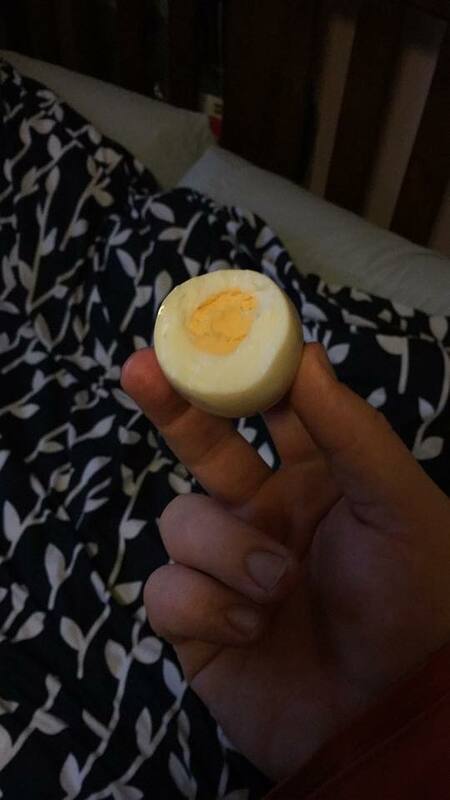 Pickled Eggs. Boil them until hard; throw them hot into cold water, which will make the shell slip off smoothly after the eggs have remained in it about ten minutes; boil some red beets till very soft; peel and mash them fine, and put enough of the liquor into cold vinegar to color it pink; add a little salt, pepper, nutmeg, and cloves; put the eggs into a jar and pour the beets, vinegar &c., over them. This makes a pretty garnish for fish or corned meats. Cut the eggs in slices when used. 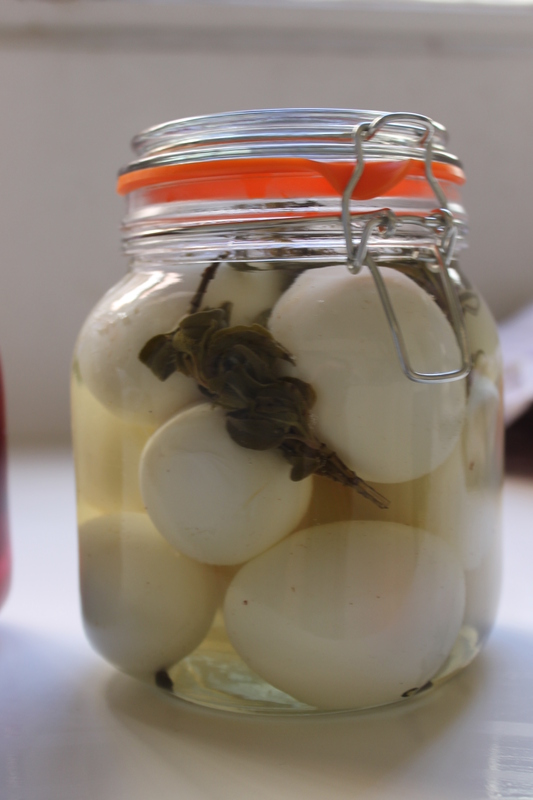 Safety Note: These are the quantities and processes that I used to make these recipes, but because the liquids are cold when poured over the boiled eggs there is a higher chance of bacterial growth than in modern pickled egg recipes. If you decide to try these recipes you should keep the eggs refrigerated and consume them within days of making them. You can also increase the safety heating the pickling liquid to boiling point and pouring it over the eggs. 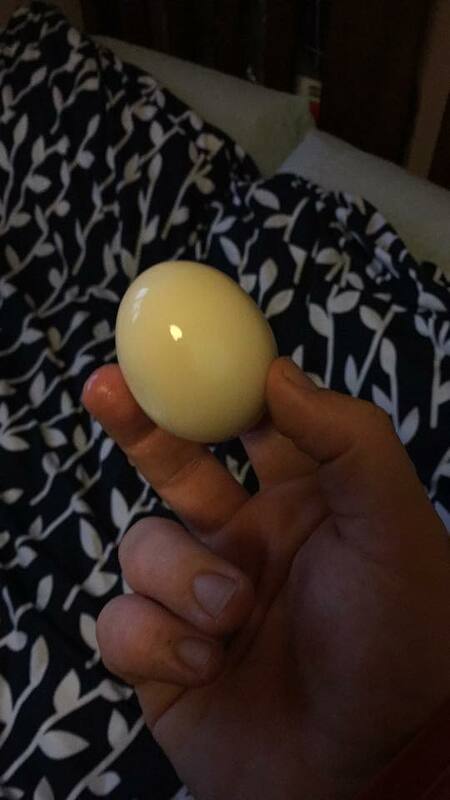 Hard boil eggs, then allow to cool and shell them. Place into a sterilised jar. Mix the vinegar, spices and sage in a saucepan and just bring to the boil. Allow the liquid to cool and pour over the eggs. Quarter the beetroot, place in a saucepan and cover in boiling water. Bring the pot to the boil and cook until the beetroot is soft, this takes longer than you would think, about 30 mins. When soft, remove the beetroot and allow the pieces to cool enough to handle. Peel the beetroot, then dice it and roughly mash the cubes. 2. Put the eggs into a saucepan, cover with water, bring to a rolling boil and simmer for 8 minutes. Allow to cool and peel. 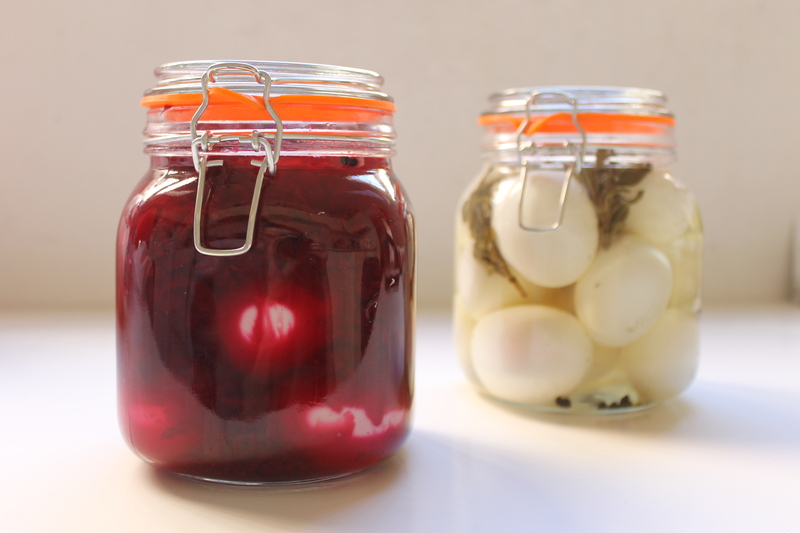 Place the eggs in a sterilised jar, then add the beetroot over the top. Mix the rest of the ingredients and pour over. 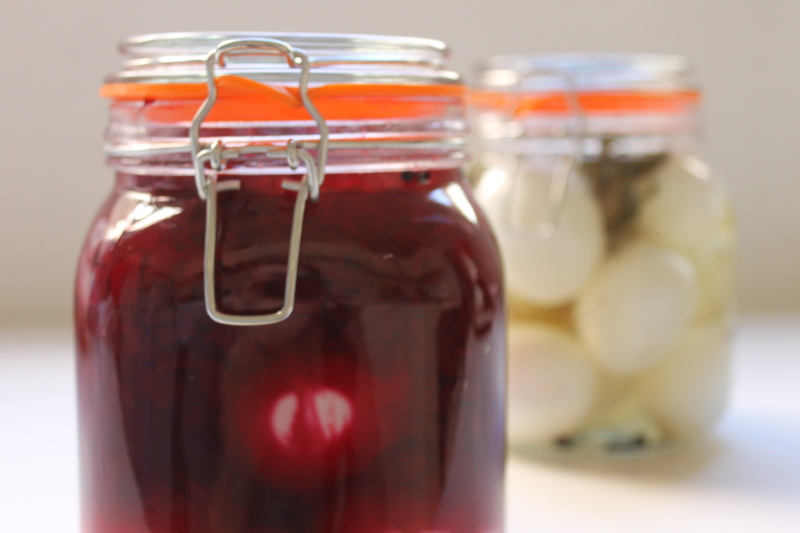 The Recipe: Pickled Eggs from Robert Smith’s Court Cookery: Or, The Compleat English Cook 128. (available here) and from The Practical American Cook Book by A Housekeeper (preview available here). How did you make it? : See above. Time to complete? : The beetroot took a very long time to cook, so those ones took over an hour and a half, but the sage ones were faster; including cooling time they probably took about an hour. How successful was it? : I only tried the beetroot ones which were a beautiful colour, slightly rubbery but very pleasant. Ryan preferred the sage eggs, but that may be because he isn’t the biggest fan of beetroot. How accurate? : I ended up changing the process of the sage eggs somewhat, because the first time that I made them I diluted the vinegar with water which would have changed the eggs preservative properties. The sage also through off a nasty scum when boiled like that. In the end I started again, boiling the eggs in water and then heating the other ingredients separately. The biggest difference in terms of ingredients is probably the type of vinegar used, but there was no indication of the type of vinegar in the recipes and I haven’t done enough research to really know what would have been used. Robert Smith, Court Cookery: Or, The Compleat English Cook (London: Printed for T. Wotton, at the Three-Daggers in Fleet-Street, 1725), 128. Dorothy Hartley, Food in England (London: Little, Brown & Company, 1999), 345. Robertson, ed., Mechanics Magazine (London: James Bounsall, 1844), 352. Andrew Boorde, The Fyrst Boke of the Introduction of Knowledge Made by Andrew Borde, of Physycke Doctor. A Compendyous Regyment; Or, A Dyetary of Helth Made in Mountpyllier, ed. Frederick James Furnivall (London: Published for the Early English Text Society by N.T. Trubner & Co, 1870), 265. Charles Perry, “Kitab Wasf Al-At’ima Al-Mu’tada [The Description of Familiar Foods],” in Medieval Arab Cookery, by Maxime Rodinson, A.J Arberry, and Charles Perry (Totnes, U.K.: Prospect Books, 2001), 397. A Housekeeper, The Practical American Cook Book (New York: D Appleton and Company, 1863), 91. And my penguin? He’s already making friends. A Housekeeper. The Practical American Cook Book. New York: D Appleton and Company, 1863. Boorde, Andrew. The Fyrst Boke of the Introduction of Knowledge Made by Andrew Borde, of Physycke Doctor. A Compendyous Regyment; Or, A Dyetary of Helth Made in Mountpyllier. Edited by Frederick James Furnivall. London: Published for the Early English Text Society by N.T. Trubner & Co, 1870. Hartley, Dorothy. Food in England. London: Little, Brown & Company, 1999. Robertson, ed. Mechanics Magazine. London: James Bounsall, 1844. Smith, Robert. Court Cookery: Or, The Compleat English Cook. London: Printed for T. Wotton, at the Three-Daggers in Fleet-Street, 1725. 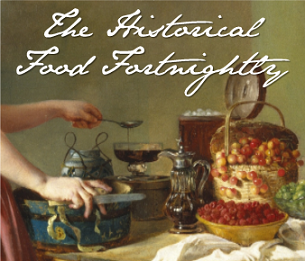 This entry was posted in Uncategorized and tagged 18th Century, 19th Century, Dairy free, Eggs, Gluten free, Preserving, Side-dishes, Snacks. Bookmark the permalink.